The liquid form of Quinary is known as Liqui-Five. This multi beneficial liquid formula of blended herbs is maintained without preservatives or synthetic chemicals. the Liqui-Five is a “Yin” and “Yang” food which is often referred to as “Sunrider Gold” as it contains 50 of the most revered longevity and vitality plants known. It is a concentrated food for nourishing the body’s five systems: Defense, Endocrine, Digestive, Respiratory, and Circulatory. It also re-establishes communication networks between all of the five major organ systems, thereby restoring synergy and balance for working with and supporting each system. Often my friends accuse me of being in love with Sunrider products, so I want to tell you why I’ve used them for the last 16 years. At age 30, I almost died from hepatitis. I was very disabled at the time so I started using different supplements to strengthen my organs. In 1997, I started using Sunrider products. I am feeling great, and I often asked where i get all my energy! I am 66 years old, but I look and feel much younger. My favorite Sunrider products are Calli, Fortune Delight, Sunbreeze Oil, Dandelion Root, Liqui-Five, and Evergreen. My husbands swears by Veros and Dr Chen Men’s formula. 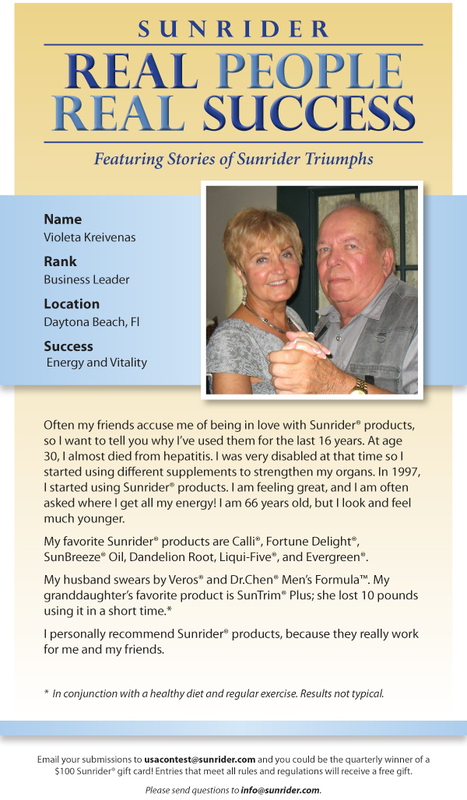 My granddaughter’s favorite product is SunTrim Plus; she lost 10 pounds using it in a short time. 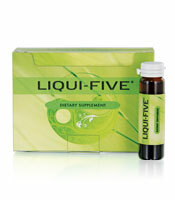 Be the first to review “LIQUI-FIVE” Click here to cancel reply.